The Bible story tells that Jericho fell on the seventh day after seven priests had blown their seven trumpets. The industrial techno engineer Trias, now a sole operator behind Ancient Methods, proclaims time has come for the “Seventh Seal”, which might carry some underlying symbolical meaning. 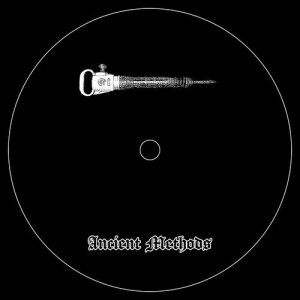 For the time being, the further agenda of Medieval-minded yet prophetic sonic warrior is unknown but the seventh installment of Ancient Methods series is again dark as night, encompassing sounds difficult to match. It belongs to the set of records I have decided to buy without any pre-listening and, as expected, no regrets on delivery. Intense and captivating experience is launched with “Knights And Bishops”, a prime example of crushing industrial rhythms with eerie whispers and raw EBM-sourced riffs, while sharpened swords are crossed when “Kings & Pawns” are chased through a treacherous swamp. “When All Is Said And Done” begins with abstract noise before the EP’s dominating grinding sound sets in, assisted by a distant chorus. Rounding up the annihilating yet intelligent EP, “Castling Becomes Inevitable” is the hardest cut with an extra portion of hammer-and-anvil sound added, all appearing like a mixture of cyberpunked Kraftwerk and trimmed Nitzer Ebb. Most tracks are moving at 124 BPM but it just amplifies the impact of the pitch-black techno war funk by the quintessential act from Berlin.